Keeping the kids engaged and interested is something that science teachers have struggled with over the years. Thanks to a brilliant idea, a hardworking teacher and a Meemic grant, that’s all begun to change. Steve Johnson, a professor at Lake Superior State University in Sault Sainte Marie, MI, applied for a Meemic grant to help change that trend. He developed the program “Who Dunnit?” to help kids gain more interest in STEM (Science, Technology, Engineering and Mathematics). “I was really excited when I found out that I won the grant because we were very limited with materials; having the grant meant that we would be able to purchase more,” he said. With the use of forensic science, he turned the tables on the students and showed them how to catch their own bad guys. Teaching kids as young as 8 years old, he showed students how to lift a fingerprint from a crime scene using ink pads and powder applicators and how to use it to identify the perpetrator with their evidence cones and photography rules. They also collected evidence from mock scenarios and mini-mysteries. He even went on to demonstrate casting footprints out of dental stone casting material and measured them to help support their case. Although the primary target audience was elementary school students, the program has been adapted to middle and high school students. “The kids really enjoyed it. … Several said that I’d better be there next year to teach them,” he said. The program has been a hit, already striking interest with surrounding schools and strengthening the relationships between LSSU and Sault Area Schools. Thanks to the relatively low costs, he believes that the program won’t be going anywhere any time soon. 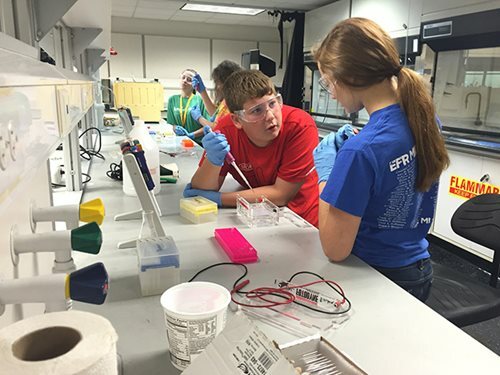 The materials were even able to be used for their Superior Edventure Camps this summer, and, to his surprise, many of high school students that enrolled in the program are considering attending LSSU based on their experience. “It’s not often that kids are engaged for a few hours, let alone six hours straight, but they were engaged until the final minute,” he said. Now, not only has Mr. Johnson helped bring a more interesting side of science to kids, but he’s created opportunities for LSSU students to gain volunteering experience, as well as arrange and conduct laboratory exercises. Apparently, science is never boring with Mr. Johnson around.